This project is one part of a vast programme created to make better use of the cultural and environmental resources of Trasimeno, and is supported by the municipalities of Castiglione del Lago, Città della Pieve, Paciano and Panicale, by the Province of Perugia, by the Sistema Turistico Locale of Trasimeno and by the Comunità Montana Associazione dei Comuni «Trasimeno – Medio Tevere» who coordinates the effort. The Gruppo di Azione Locale «Trasimeno – Orvietano» has also given its support. The main goal is to improve the awareness of the masterpieces of art produced at a very important time in the history of the Trasimeno area, and keep them in the context of the area which inspired them and which is represented in an evocative way by Pietro Perugino. The project also foresees, with the participation of a group of companies, the creation of coordinated services aimed at creating a guided tour of the area, and therefore making the spreading of knowledge of its particularities easier. Pietro Vannucci, known as «Il Perugino», was inspired to paint his celebrated sceneries by what he saw in the area that goes from Città della Pieve towards Lake Trasimeno and the Valdichiana. In order to truly enjoy these scenes one must follow along the road which from Città della Pieve goes to Paciano, Panicale and Castiglione del Lago, marked by the masterpieces of the Maestro and his School. It is a particularly sentimental route immersed in a scenery of gently rolling hills with marvellous views of the Lake Trasimeno. Vannucci did not paint actual landscapes, but the depicted scenes in his masterpieces along this route underline the close relationship between nature and artistic creation. The route also underlines the creation of paintings which can be ascribed to the Tuscan-Roman school of Mannerism. An all inclusive ticket, available at any one of the ticket sales points, is valid for entrance to all of the points of interest. A guidebook of the route is also available. 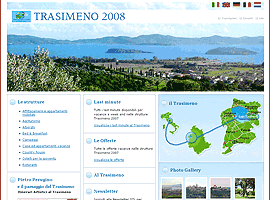 Trasimeno 2008, holydays accommodation in lake Trasimeno area: hotels, farmhouses camping, bed & breakfast, holiday houses and flats for rents. Last minute and special offers.